We really enjoy working with our Home Warranty customers. In fact, this opportunity has allowed us to developed many, many long lasting and valuable relationships. Likewise, it is our responsibility to help you understand the terms and provisions of your policy and make sure you receive the service you deserve. Yes, it can get confusing, but we are very committed to helping you sort it all out. Sometimes we need special order parts in order to properly service your home. In some cases, it takes significant time to receive needed parts and this can be understandably frustrating. Unfortunately it's unavoidable. We do all we can to expedite prompt delivery of parts and material. So, please be assured we are constantly tracking your order and anticipating impending delivery so we can make needed repairs as soon as possible. We are all bound by what "is" and what "is not" covered according to the terms of your specific warranty policy. Because an item is not covered does not mean all is lost. As a Warranty Company Policy Holder, we offer reduced rates on service and discounts on parts, outside the network of your Warranty Company. This is a valuable opportunity for you to receive cost efficient repairs from a performance proven company. In some cases you may wish to "Cash Out" instead of accepting covered services offered by your Warranty Company. This simply means you will receive a cash payment from your warranty company so you can directly contract with someone for work needed. This is something you must discuss with your Warranty Company. An item described as being "Builder's Standard" means that it is of general or basic grade and quality. No special upgrades, colors or styles are included. There are times when a defective item is covered by the terms of a Factory Warranty, particularly where water heaters are involved. We automatically research your situation to determine if you are eligible for factory credit or replacement. 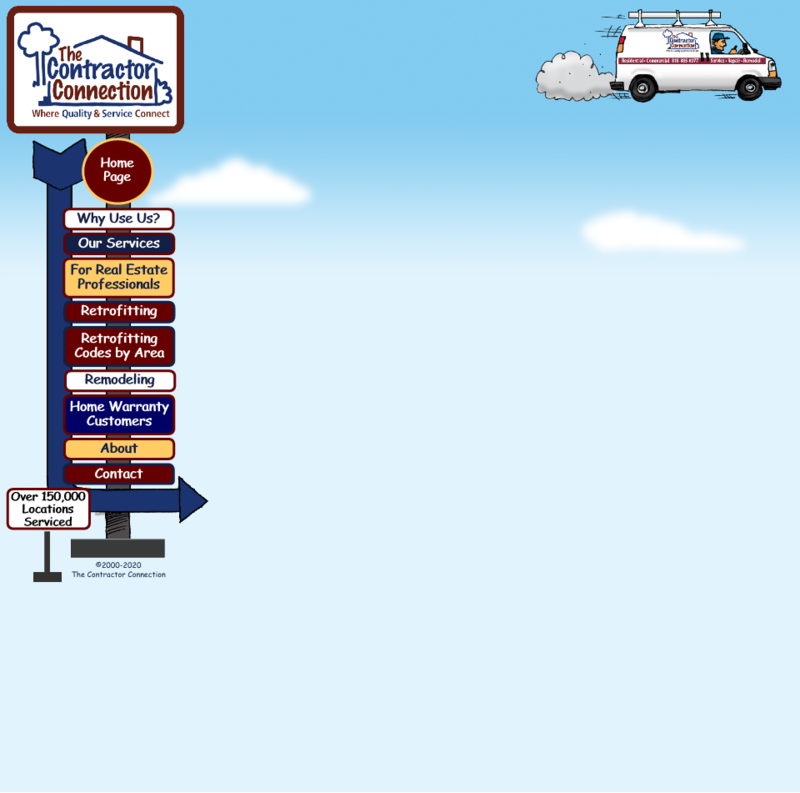 The Contractor Connection is an authorized service provider representing most major manufacturers. Opening areas to gain access inside walls through drywall and stucco are usually covered. Sometimes replacement of drywall or stucco is also covered. Exceptions would be where structural components such as shear wall or framing members are concerned. Repair needs located outside the foundation walls of your home are usually not covered. Mold and Water Damage cleanup, mitigation or remediation needs, are not covered by nor are they the responsibility of your Warranty Company or The Contractor Connection. You must contract for these services directly with an independent company. Financial compensation or payment for Mold and Water Damage is not provided by your Warranty Company or The Contractor Connection. Secondary Damage is not covered by, nor is it the responsibility of your Warranty Company or The Contractor Connection. You must contract for these services directly with an independent company. The Contractor Connection is qualified and has extensive experience performing these kinds of repairs. Financial compensation or payment for the repair of Secondary Damage is not provided by your Warranty Company or The Contractor Connection.